I was interested, upon discovering the site What does the Internet think? to find out what the Internet thought about librarians, archivists, and museum curators. This, of course, is not a conclusive scientific study, but it is an indicator of perception, and of course, does not take into account the Deep Web, and there is no benchmark to determine how representative the sample is. Nethertheless, the results were interesting. This is quite fascinating. Of the three, indicated here (and again, this is an indicator only, it would need further testing for both reliability and validity), museums are viewed most positively, followed by archivists being viewed positively. Librarians, however, are viewed negatively. There is, of course, the flaw that the question of perceptions of museum professionals could not be tested, so will I check on that again in future, once this category is indexed. But this snapshot raises a host of interesting questions for further reflection, especially for librarians. This entry was posted in Cultural Heritage and tagged Archivists, Internet, Kim Baker, librarians, museum curators, perceptions. Bookmark the permalink. 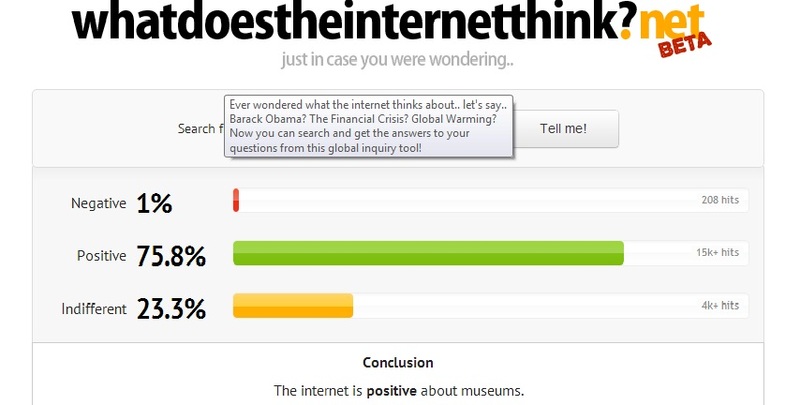 7 Responses to What does the Internet think of librarians, archivists and museum curators? Well, that is interesting. Most people I know think librarians are not cool, but people who work in archives and museums are. Would be interesting to know why people think librarians are uncool. Well, I think it is most unfair. Librarians work hard and go out of their way to serve their public. We do not just stamp books, we find information for people. That is very important. I do need to emphasize that this test is not yet conclusive. The website is in beta phase, so I will check again in a few months. But having said that, I too have heard some not so positive views of librarians, mainly, I think, because people in general do not really understand what it is they do, but also, because some people have had bad experiences with librarians. And many have had positive experiences too. Why that should be different from archivists and museums, though, remains unanswered, and of interest to me. What is it that museums and archivists are doing that makes people view them positively? Also, I know that in some regions, especially in Latin America, Asia, and the Levant regions, librarians are highly respected. And all of those regions have a hunger for knowledge. So: is the negative view of librarians mostly a Western phenomenon? Or, is it because the Internet is seen as the quickest and most efficient way to source information, thus bypassing librarians? But why does this not apply to archivists? And museums? So many questions, I feel another research project coming on……. Had you thought about searching the word curators? It’s not exactly the same as museum professionals, I understand. Now I’m curious if libraries would have a different return than librarians and archives vs archivists. Yes, I did try, and it came back positive (58% as I recall), but I wasn’t sure that the term was indexed in the context of museums, so did not include it here. Wow–went and played a little myself. Singular librarian was way worse than plural. Library and libraries were more positive. Weirdly fascinating. Weirdly fascinating indeed. 🙂 I also noticed that – positive view of libraries, but not librarian/s. I plan to try this again in a few weeks, to see if more items are reflected in the search results, and also to check whether museum curators have been indexed as such.